I love a good tag! So when I saw this one created by the lovely Danniella from Famous in Japan, I added it straight to my list! 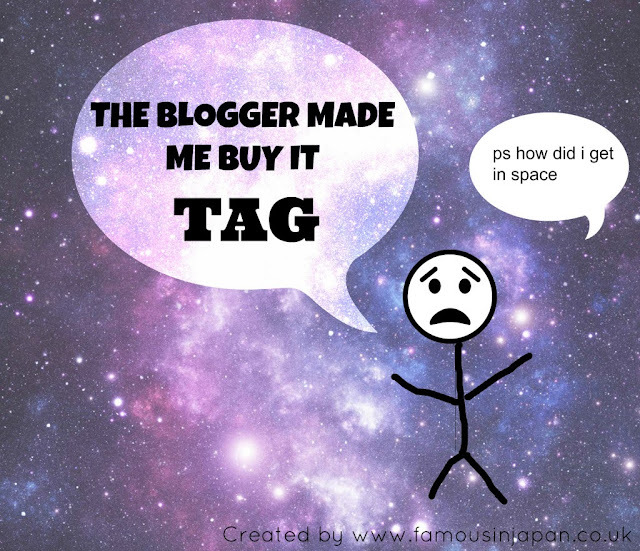 Blogging has definitely meant that my bank account gets dented more often than it would otherwise and I always read blogger reviews if there's a product I want to find out more about before buying. So here I go with my answers! For reviews and swatches, especially of new products, I'd either head to The Sunday Girl or British Beauty Blogger. I also regularly head to Temptalia, which is particularly fab for MAC reviews and swatches. For skincare, Caroline Hirons is one of my favourites. I think it probably depends on the product, so a bit of both really. If it's something I really want but haven't given in yet, one or two rave reviews would definitely sway me to buy. However if it's the opposite because I haven't really heard of it or been tempted by it, then I'd probably read a lot more reviews before making a decision on whether to purchase or not. Ooh that's hard one! I have quite a few... Probably the Real Techniques brushes, closely followed by the Pixi Glow Tonic. I think it would have to be the tinted version of Maybelline Baby Lips. I read so many rave reviews but really there wasn't anything that made them special, apart from maybe the super cheap price, but you get what you pay for with it. I'd rather pay more for a tinted lip balm that actually makes my lips feel hydrated in the long term rather than the short term. Some Crownbrush brushes, the REN ClearCalm 3 Clarifying Clay Cleanser, Lush Shoot for the Stars Bath Bomb, Lush Golden Wonder Bath Bomb and the Clarins Essential Eye Palette (so excited about the latter as I desperately wanted it when it was released, then found it recently in a blog sale!). Yes definitely - Pixi Glow Tonic, Maybelline Baby Lips, L'Oreal Confetti Top Coat, MUA Undress Your Skin Highlighting Powder, Bourjois Cream Blushers, MAC Lipstick... and probably many more!! However apart from the Baby Lips, I don't regret buying any of these as they're all fab products. The Urban Decay Naked 3 is one that immediately springs to mind, as it seems like everyone owns it and is talking about right now. To be honest I think I prefer the shades in the other two palettes, neither of which I own either!! I just can't bring myself to spend nearly £40.00 on an eyeshadow palette. I also never bought any of the Rimmel Apocalips - I haven't been quite convinced by these. I think it's a mix of both... I do read a lot of reviews but there are occasions where I'll pop into Boots or Superdrug and pick up something on impulse that I haven't read about beforehand! I did this with the Seventeen Doll'd Up Mascara and Phwoarr Paint, but ended up really liking both. I hope you enjoyed reading my answers! As usual I tag all of you lovely people reading this, so pop your links in the comment box if you do this tag! Otherwise let me know what are your favourite and least favourite products you've bought due to blogger hype? I just got myself naked 2. after using it i can see it is worth the money but its alot to fork out! i got the apocalips but never got the baby lips! I love this tag! Definately one of the better ones out there. I often rely on blog reviews before buying a product, or when deciding on what to buy!